One year after Nnamdi Kanu, leader of Indigenous People of Biafra (IPOB) was abducted by Nigerian government; Biafrans’ message has not changed. And that message is that “Nnamdi Kanu must be set free without any further delay”. Unless that is done the huge calamity that is already befalling the evil contraption called Nigeria will continue in more disastrous ways. In fact, the ones that will happen from now on will worse, huge and unimaginable. Already, the North has experienced earth tremors in Kaduna State; they have witness the death of hundreds of their cattle struck by thunder; they have witness locusts wiping out 21 villages in Buhari’s Sokoto state; and they have been witnessing religious upheavals. But all those are just the beginning of birth pains. The worst are yet to come if Nigerians turn deaf ears to demand that Kanu be set free. In fact, all these happenings are yet divine warnings. 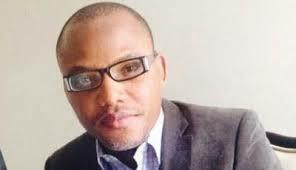 The worst will still occur if they refuse to release the Biafra leader. 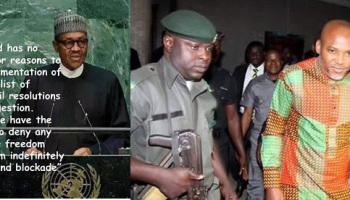 Not only that Kanu must be set free, Biafrans are also demanding that Nigerian rulers begin to take their instruments of occupation away from Biafraland. Unless that is done, the Nnamdi Kanu’s prophesy – which is already loading – (that Somalia will look like paradise in comparison to what will happen to Nigeria) is definitely coming to pass. Kanu was abducted by Nigeria’s Department of State Security (DSS) on October 14, 2015. Since then, the courts have ordered his release thrice; and thrice Nigerian war criminal, and mass murderer, Muhammadu Buhari, and his cohorts have refused to obey the court order. Instead they have been harassing the judge in order to intimidate him. Unfortunately, they did not know that their refusal to release him and set in motion instruments for Biafraexit, marked the commencement of Nigerian descent into the abyss of destruction. Since then, Nigeria has continued to go low from one economic disaster to the other, which is why it is battling recession today. The fear of many informed Nigerians is that with the value of its currency (Naira) falling to an all-time low; the economy will slip into depression soonest. Nigerians already know that they are in hot soup as Buhari has unleashed before their very eyes, the worst dictatorship they have ever witnessed in their history. It was under this one year that the maximum ruler bared his fangs against the media, arresting and detaining their owners and workers. It was after they succumbed to his threats that he shifted attention to opposition politicians. It was under this one year that Buhari completely put a wedge between Nigerians, across ethnic and religious lines. He did it through his political appointments; through his unleashing of his fellow Fulani herdsmen to invade towns and villages of people of other ethnic nationalities, and to butcher and kill the people. Under this one year, Buhari has also released Boko Haram members held in prison cells – both those already serving sentences and those still under trial. He has gone after judges whose judgment went contrary to his demands, like Justice Ademola. Ademola was among those that struck off his trumped-up charges against Nnamdi Kanu. It was also under this one year that Buhari abducted some judges from the Southern part of the country, just to taint them and destroy their images, because he had in mind of appointing their juniors as to higher offices. Now, the message from Biafrans to Nigerians is clear – Nnamdi Kanu must be set free, and Biafra must be restored. They must begin to work towards this. If they fail to do so, Buhari will finish them off, succeed in Islamising them, and Biafra will still be restored. Nigerians must understand that freedom for Kanu will bring their freedom from Buhari’s dictatorship. So, Nnamdi Kanu must be free! Biafra must be restored! There is no two ways about it.